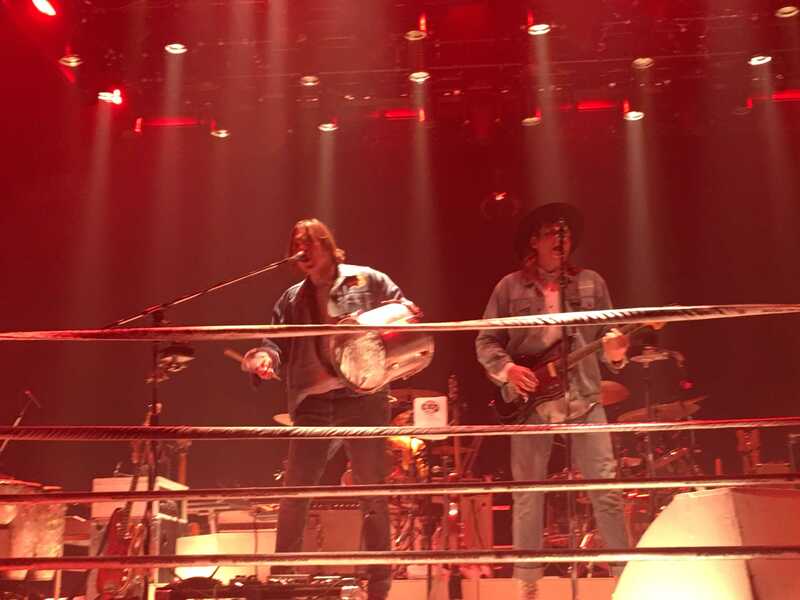 Arcade Fire sets the stage big when they perform live. 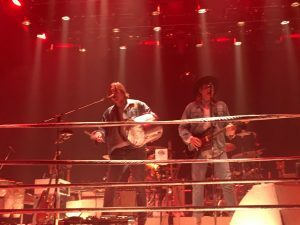 When I saw them in Las Vegas, they had a square stage designed like a boxing ring. The 9 musicians on stage play somewhere between 20 and 30 instruments. Just 3 weeks after the worst mass-shooting in US history, the Canadian indie-rock band fearlessly took the stage at Mandalay Bay. Lead singer Win Butler offered his condolences to the victims of the horrible attack followed by “f*ck being afraid”. 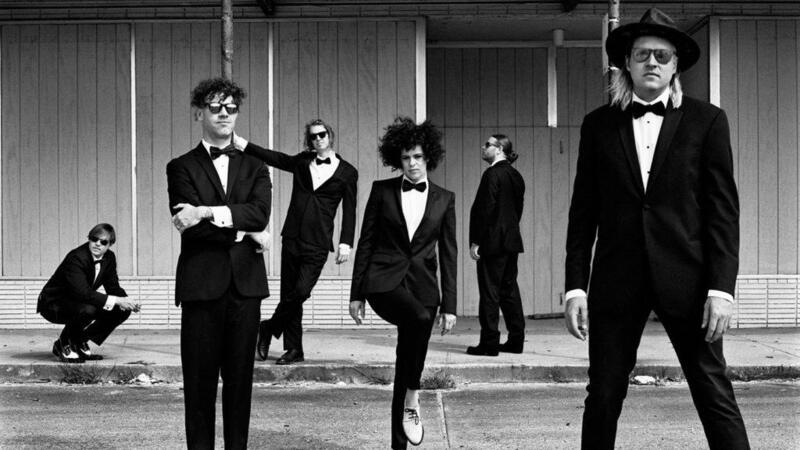 Arcade Fire neither lacks style nor confidence. In a recent interview with the Chicago Tribune, Butler said, “I feel like we’re one of the best rock bands on Earth now.” The lead singer has also been quoted saying they are one of the best performing bands of all time. Before you dismiss them as crazy, go to one of their shows and then decide. The squareness of stage meant no front. Arcade Fire was constantly moving around rotating from side to side. They had enough members so that all sides of the stage were always filled. The beauty of this design was it allowed more people to get close to the stage. The constant rotation gave the concertgoers a chance to meet each individual musician, instead of staring at one the entire night. Opening act Angel Olsen, didn’t have the band members or preparation to fill the stage in the same way. They stuck to one side, and unfortunately my friends and I were on the wrong side. Frustration arose as we could just see their backs. They sounded hollow, as if they weren’t able to fill the entirety of the arena. Had I seen the indie-folk artist in a cozier venue and actually been able to see them, I might have enjoyed the show. 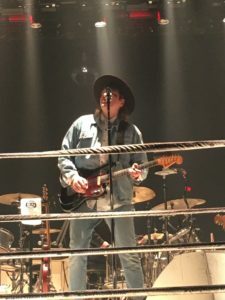 The stage wasn’t the only boxing themed part of Arcade Fire’s performance. As they were entering, an announcer on the overhead speaker stated each musician’s “boxing” record. They walked through the crowd with their pump-up music blaring (“Everything_Now (continued)”), then climbed through the ropes and started into “Everything Now”. The next hour and a half were awesome. It is pretty obvious when bands love performing. Their passion radiates through the crowd who in turn loves watching them perform. Smiles were visible on the faces of band members Richard Reed Perry and Regine Chassagne. Will Butler is one of the most animated performers I have ever seen. Whether he is banging on a drum or jamming on synth, just watching him will bring you pure joy. 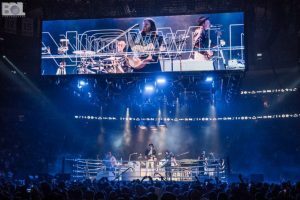 Arcade Fire’s sound doesn’t miss a beat transitioning from recordings to live shows. Balancing that many different musicians and instruments can be difficult but they do it with ease. The music is extremely powerful yet so fine-tuned you can still hear each individual instrument. The disco balls and strobe lights are programmed beautifully so that the lights portray what the music is playing. There are moments of complete darkness and others when fog is so thick they disappear from view. 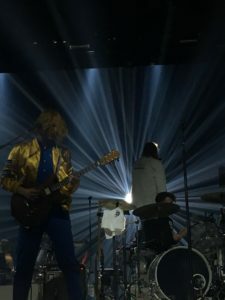 Light and dark are themes that Arcade Fire loves exploring in their music and they bring that into their live shows. Their setlist was spread-out across their 5 albums playing at least 3 songs from each. They finish with fan favorite “Wake Up”, and leave the stage with the crowd still singing the chorus. Many concertgoers continued singing as they flooded into the casino. I don’t have the expertise to say if Arcade Fire is one of the greatest performing bands of all time, but it was one of my favorite shows I’ve ever been to.